The workstation market has always been a consistent seller. The dream of offloading to an on or off-site VM and a cluster for work processing still lies more in the realm of mass production over local quick-to-compute work, and because of that low latency for quick interaction, workstations are here to stay. While the consumer is going smaller, business aims to scale and on the back of our P300 review, Lenovo sent their 34kg dual Xeon E5 v3 behemoth version of the ThinkStation P900 for review. When designing a workstation, the teams have to think of the two main people that will interact with it. On one side is the user who will want quick response times, a specific feature set and the ability to complete intense compute tasks quickly. A company such as Lenovo can enable this through motherboard design, component pricing and adapting the preinstalled software. This includes getting official ISV certification for many of the professional level applications that someone might want to use a workstation for. The other side of the equation is that the system has to be suitable for the person who is repairing or upgrading it over the lifetime of the unit. The ability to easily remove, diagnose or replace components on the hardware side helps avoid downtime and improves overall work efficiency. So far in our foray of reviewing workstations some of them have been built to be proprietary and difficult, whereas others adhere to standard base unit design principles. This is where Lenovo's new ThinkStation design is planned to attack. 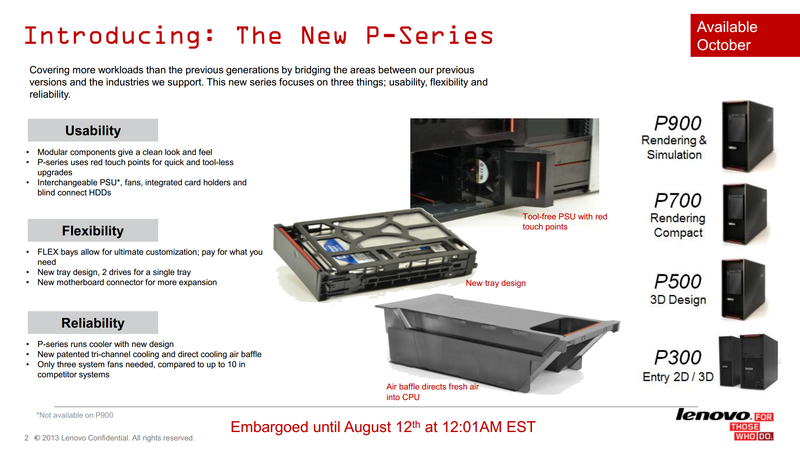 We reported on the official announcement at the end of last year, with the P500, P700 and P900 range getting the full overhaul in terms of ease of use along with industrial design. At the time, Lenovo promised air baffles for directional flow and a Flex system to allow hybridization of specific functionality depending on the customer need. Ryan was lucky enough to see a demo unit in the flesh around the same time as the announcement, and I received numerous emails and tweets about the design. Well I am glad to say that Lenovo has now sent us one to review. We were sent the P900 no less, featuring the top of the line in design and weighing in at almost $17000. The only way this could get more expensive would be through denser memory or more PCIe coprocessors. 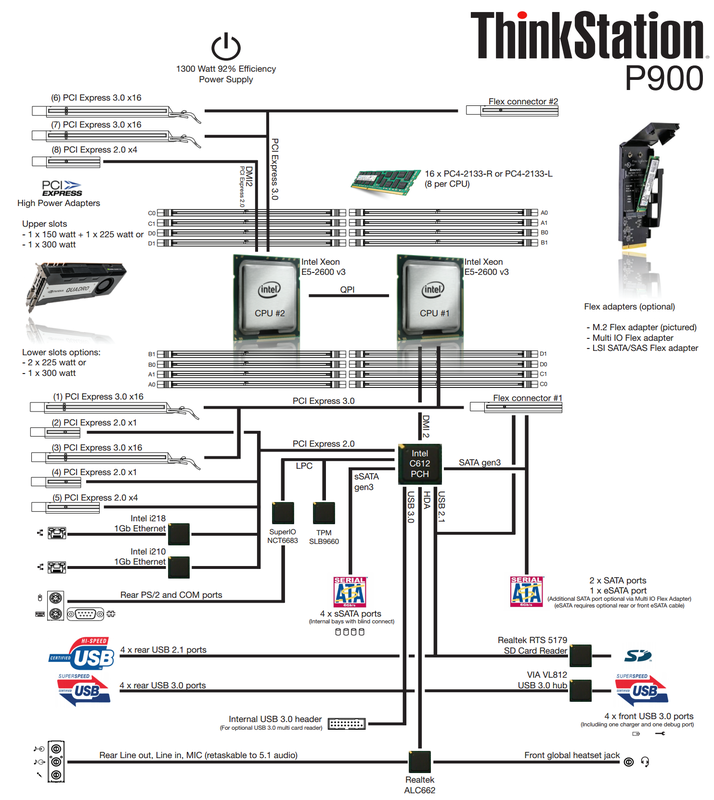 The P900 can hold three NVIDIA K6000s (or Xeon Phi based derivatives) along with a single slot PCIe card. The full specification of our sample gives two Intel Xeon E5-2687W v3 processors - these are the high TDP 160W models with 10 cores at 3.1 GHz (3.5 GHz Turbo) each that we reviewed at the end of last year that retail at almost $2140 apiece. These are paired with the NVIDIA Quadro K5200, an 8GB Kepler based GK108GL with 2304 CUDA cores running at 650 MHz. For the DRAM, our sample came with eight modules of 8GB DDR4-2133 ECC from SK Hynix. 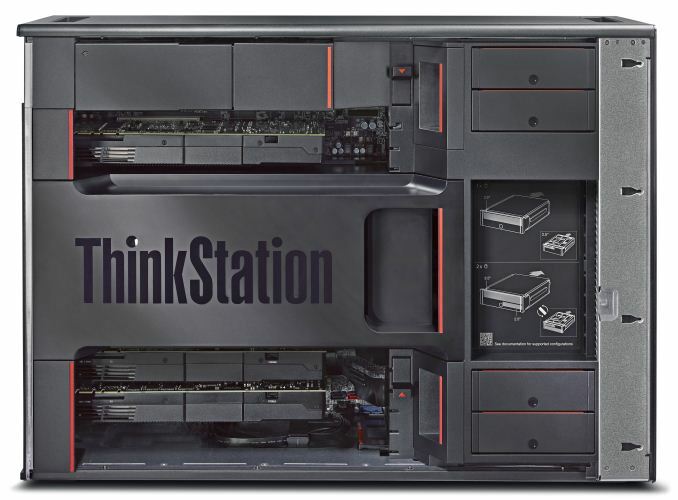 The P900 sits atop the ThinkStation range with dual Xeon E5-2600 v3 processors, starting (from the website) at $1830 with a single E5-2609 v3 (six cores, no HT, 1.9 GHz) with one module of DDR4-2133 memory and an NVIDIA Quadro K620 (Maxwell, 2GB, 384 CUDA cores at 1000 MHz) discrete card. This is in comparison to the P700 which focuses on a compact 2P Xeon build and the P500 which is a 1P Xeon system but still based on the LGA2011-3 socket. Clearly the first port of call for criticism off the bat is going to be the list price, and I agree, for the specifications Lenovo's pricing seems way off, similar to that of the P300 we reviewed last year. Lenovo's answer stems from the fact that they get almost zero sales from the website, which acts as a business-to-consumer frontage, but the ThinkStation range is more often sold as a business-to-business unit either directly to the vertical industries (financial, medical, defense, oil and gas) which often get volume discounts or don't care about pricing, or as an OEM to resellers who buy closer to list and can add their own components. Lenovo's attitude in this final case is that they don't want to compete with their resellers, who may ultimately be able to offer a better deal/support package to individual consumers buying single units. 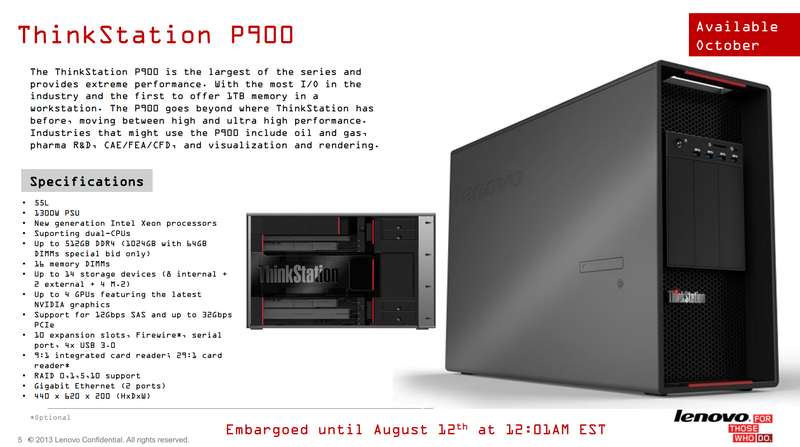 Despite the individual pricing, as a unit and by extension the company, the P900 and Lenovo are lucky. This is the first true high end halo workstation product we've reviewed at AnandTech for a long while, and Lenovo has pulled out the bells and whistles on the high end designed to dazzle and amaze. We are in talks to get similar systems from HP and Dell, however my lack of experience with their designs means that for now, Lenovo has my undivided attention. Given the level of functionality that Lenovo is going for with the P900, a lot of the pathways here make sense in order to maximize bandwidth and location. Both of the Flex connectors are PCIe 3.0 x8, allowing for the FLEX modules to use whatever hardware they need. The front USB 3.0 ports are provided by the VIA VL812 hub, with one of the ports acting as an always-on charger port. Perhaps the only downside to the specifications here is the Realtek ALC662 audio codec, which is best described as a poor laptop audio solution. Most motherboard and system manufacturers at this point use an ALC892 as the bare minimum, or an ALC898/ALC1150 which sit at the top of the stack for less than a few cents over the cost of the ALC662. Now ultimately users can add their own audio cards, and the P900 isn’t particularly designed for audio, but the laptop-class codec shouldn’t be here. Most people don't use AdBlock because they're unnecessary add ons to a web browser.